Guide to developing OpenAM client applications and service providers. OpenAM provides open source Authentication, Authorization, Entitlement and Federation software. This guide demonstrates how to handle sessions to permit single sign on and single log out in OpenAM client applications. This guide further demonstrates how to use the OpenAM APIs including both APIs for client applications, and also SPIs for authentication, policy, service management, delegation, and identity storage. Finally, this guide demonstrates how to write your own web policy agent. This guide is written for developers who adapt client applications to use OpenAM access management capabilities. It is also written for designers and developers extending and integrating OpenAM services for their organizations. You do not need to be an OpenAM wizard to learn something from this guide, though a background in access management and developing web applications or developing for web and application servers can help. You can nevertheless get started with this guide, and then learn more as you go along. Although policy agents and standards support make it possible for applications to use OpenAM for access management without changing your code, some deployments require tighter integration, or direct use of supported protocols and OpenAM APIs. OpenAM supports a range of protocols and APIs that allow you not only to define specifically how access is managed in your client applications, but also to extend OpenAM capabilities to meet even those deployment requirements not yet covered in OpenAM. This short chapter presents an overview of the APIs and protocols that OpenAM supports. This guide primarily covers the OpenAM client APIs and SPIs, with emphasis on the Java APIs. OpenAM provides client application programming interfaces for a variety of needs. The OpenAM Java APIs provided through the OpenAM Java SDK let your Java and Java EE applications call on OpenAM for authentication, and authorization in both OpenAM and federated environments. Detailed reference information is provided in the OpenAM Java SDK API Specification. The C SDK also provides APIs for native applications, such as new web server policy agents. The C SDK is delivered with OpenAM for Linux, Solaris, and Windows platforms. OpenAM exposes a RESTful API that can return JSON or XML over HTTP, allowing you to access authentication, authorization, and identity services from your web applications using REST clients in the language of your choice. OpenAM provides Java based service provider interfaces to let you extend services for the requirements of your particular deployment. Some examples of the plugins you can write follow in the list below. This guide demonstrates how to implement such plugins. Post authentication plugins perform additional processing at the end of the authentication process, but before the subject is authenticated. Post authentication plugins can for example store information about the authentication in the user's profile, or call another system for audit logging purposes. Policy evaluation plugins implement new policy conditions, send attributes from the user profile as part of a policy response, extend the definition of the subjects to whom the policy applies, or customize how policy management is delegated. Identity repository plugins let OpenAM employ a new or custom user data store, other than a directory server or JDBC-accessible database. Client applications access OpenAM services for authentication, authorization, and single sign on/single log out through the use of sessions. Client applications can also be allowed to manage authorization policies. Client application integration with OpenAM can be coupled loosely, as in the case of an application running in a web server with an OpenAM policy agent to handle interaction with OpenAM service, more directly, as in the case where the client interacts with OpenAM over protocol, or tightly, as in the case of an application using the OpenAM Java or C API to interact with OpenAM services. This part of the guide covers client interaction with OpenAM over supported protocols and using OpenAM APIs. This chapter shows how to use the OpenAM RESTful interfaces for direct integration between web client applications and OpenAM. To call the API, access URLs under identity/ where OpenAM is deployed, such as https://openam.example.com:8080/openam/identity/. You can select the output format returned by specifying json/ or xml/ in the URL after identity/. For example, to return JSON, specify https://openam.example.com:8080/openam/identity/json/. For the examples in this chapter, OpenAM has c66Encode for cookies activated. The encoding ensures that OpenAM tokens need not be percent encoded before being submitted with a request. Thus, an example token looks like this. Without c66Encode activated, the same token might look like this. In the latter example, you would have to percent encode the =, @, and # characters in your requests. In this chapter, long URLs are wrapped to fit the printed page. Simple authentication with a user name and password returns a token. If you must specify parameters as when authenticating to /UI/Login, you provide a percent encoded string of the parameters as the value of the uri parameter. You log out using the token to end the user session. You check whether a token is valid as follows. An invalid token returns a 401 and an error page. With a valid token, you can retrieve attributes about the subject. OpenAM returns a series of name, value pairs. You can specify attributes to limit what you retrieve. When retrieving attributes, you can refresh the session thus setting the idle time to 0, by adding the boolean parameter refresh=true to the query string. You can call on OpenAM to decide whether to authorize access to a protected resource based on a valid token. Of course, you must percent encode the resource URI. To indicate access denied, OpenAM returns boolean=false. Additionally, you can access entitlements and entitlement policy decisions using the REST interface. In order to access the entitlements interface, you cannot however use the authentication token as is. Instead you must encode the token as performed in Encoder.java, and then URL-encode the result. The entitlements REST interface uses the following path suffixes and query string parameters. Path suffixes for entitlements include the following. Query string parameters for entitlements include the following. subject=encoded-token, where the encoded token is as describe above. action=get, or action=post, which identifies the user agent action when requesting a decision. resource=resource-url, or multiple resources=resource-url parameters for multiple decisions. env=requestDnsName%3Dfqdn, env=requestIP%3Ddotted-quads, env=requestTime%3Dseconds-since-epoch, and env=requestDnsName%3Dtime-zone where time-zone is from Java TimeZone.getTimeZone().getID(). The env parameters thus express conditions. You can send OpenAM messages to log, specifying the message content and the log file in which to write your message. Logging takes a valid appid token for the subject with access to log the message, and also a subjectid token for the user whom the message concerns. If the tokens are valid and the access rights correct, your message ends up in the log specified. "Not Available" INFO    o=openam    "cn=dsameuser,ou=DSAME Users,o=openam"
id=amadmin,ou=user,o=openam "Not Available" rest.access "Not Available"
This section shows how you create, read (search), update, and delete identities using the RESTful API. OpenAM lets you create user profiles, and also create web and J2EE policy agent profiles. When you create an entry, you must provide the following parameters. LDAP attribute values for the identity to create. For example, identity_attribute_names=sn&identity_attribute_values_sn=Jensen. Reading is similar to attribute retrieval, as described in Section 3.3, "Token Validation & Attribute Retrieval", but obtained using the token of a user with permissions to perform the search, as shown in the following example. You can search for user IDs by providing the following parameters. LDAP attribute values for the identity to search. For example, attribute_names=sn&attribute_values_sn=Jensen. You can update an identity with the same parameters used to create identities, provided the token corresponds to a user with access to update the identity. You can also delete an identity. This chapter introduces OpenAM Java SDK. OpenAM Java SDK is delivered in the samples/opensso-client.zip where you unpacked the full version of OpenAM, such as /path/to/OpenAM/samples/opensso-client.zip. To prepare to install the OpenAM Java SDK, first unzip opensso-client.zip. As a result, you have two directories that include the SDK and also sample command-line and web-based client applications. This directory contains the SDK and client sample commands. This directory contains a web application archive with client samples accessible through the browser after you install the .war in a web application container. The command-line samples access OpenAM over HTTP or HTTPS. Set up the samples to connect to OpenAM. This sets up the configuration file for the samples, resources/AMConfig.properties. Read the comments in the file to see the configuration settings, many of which are similar to those used by OpenAM on the server side. Check that the login sample works. The web-based samples also access OpenAM over HTTP or HTTPS. Browse to the application you deployed to configure access to OpenAM. Use the following hints to complete the configuration. After successful configuration, click the link to return to the URL where you deployed the application to view the available sample clients. This chapter looks at authentication with the OpenAM Java SDK and at the sample client, Login.java, which demonstrates authenticating to OpenAM from a client application, provided a realm, user name, and password. With OpenAM, your client application performs the following steps to handle authentication. Sets up an AuthContext, based on the realm in which the user authenticates. Starts the login process by calling the AuthContext login() method. Handling authentication callbacks to retrieve credentials from the user who is authenticating. Your application loops through the authentication callbacks by using the AuthContext getRequirements() and hasMoreRequirements() methods. Each time it finishes populating a callback with the credentials retrieved, your application calls submitRequirements() to send the credentials to OpenAM's Authentication Service. After handling all authentication callbacks, your application calls the AuthContext getStatus() method. On login success, OpenAM sets up an SSOToken that holds information about the authentication, and also about the user's environment and session. When the user logs out, your application can end the session by calling the AuthContext logout() method. The AuthContext class is provided by the com.sun.identity.authentication package, part of the OpenAM client API. Callback classes are provided by the javax.security.auth.callback package, which provides callbacks for choices, confirmations, locales, names, passwords, text input, and text output. See the OpenAM Java SDK API Specification for reference. As the sample client gets the realm (called organization in the sample), locale, and authentication module to set up the authentication context, there is not need for a language callback to get the local afterwards. The Login.java example does, however, show simple ways of handling callbacks for the command-line context. The implementation of the sample client follows. String passwd = (new BufferedReader(new InputStreamReader(System.in))). For instructions on building the sample clients, see the chapter Using the OpenAM Java SDK. This chapter looks at handling session tokens with the OpenAM Java SDK using the sample client SSOTokenSample.java. When a user authenticates successfully, OpenAM sets up a single sign on session for the user. The session is associated with an SSO token that holds information about the authentication, and also about the user's environment and session. OpenAM disposes of the session when the authentication context logout() method is called, or when a session timeout is reached. At that point the SSO token is no longer valid. When your application has an AuthContext after successful authentication, you can retrieve the SSO token from the context. 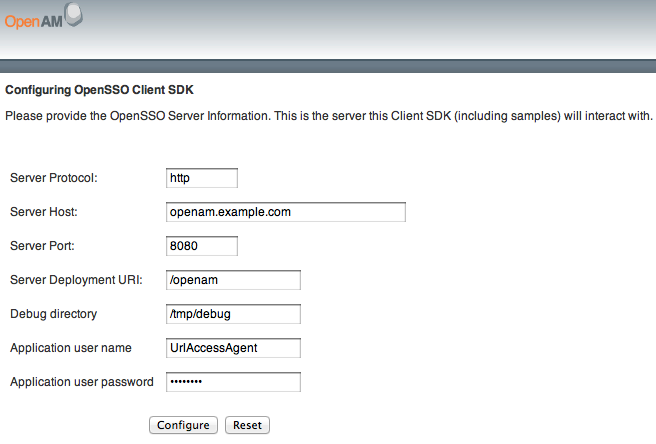 You also can get the token as shown in the sample client by passing an SSO token ID from OpenAM to an SSOTokenManager. If your application needs to be notified of changes, you can register an SSOTokenListener on the token by using the token's addSSOTokenListener() method. OpenAM then calls your SSOTokenListener ssoTokenChanged() method when the session times out, is disposed of, or has a property that changes. The sample client takes an SSO token ID to get the token from OpenAM, and then displays some information from the SSO token. The implementation of the sample client follows. // isValid method returns true for valid token. // Get the SSOTokenID associated with the token and print it. // Set and get properties in the token. Before you run the script that calls the sample, authenticate to OpenAM in order to have OpenAM generate the SSO token ID. To see the SSO token ID, you can either authenticate on the command line using the RESTful authenticate command, or alternatively run the SSOTokenSampleServlet web-based sample. SSO Token validation test Succeeded. Notice both the properties populated by OpenAM, and also the two properties, TimeZone and County, that are set by the sample client. If your application implements a listener for change notification, such as a SessionListener to handle notification when a session is invalidated, then you must configure the following settings in the AMConfig.properties configuration file for your application. Set this parameter to http://host:port/context/notificationservice. Set this parameter to true. Set this parameter to false. The above configuration to access the notification service also applies for other types of listeners, such as ServiceListener, and IdEventListener implementations. See the OpenAM Java SDK API Specification for details on the available listener interfaces. This chapter shows how to request policy decision by using OpenAM Java SDK. The chapter focuses on the sample client, PolicyEvaluationSample.java, which demonstrates making a request to OpenAM for a policy decision about access to a web resource. OpenAM centralizes policy administration, policy evaluation, and policy decision making so that your applications do not have to do so. In many deployments, OpenAM policy agents and the Open Identity gateway can handle policy enforcement independently from your application code. If your application does need to request a policy decision from OpenAM, then your application can retrieve a PolicyEvaluator from a client-side PolicyEvaluatorFactory, and then call the PolicyEvaluator getPolicyDecision() method. For boolean decisions such as allow or deny, your application can also call the isAllowed() method. To make a policy decision, OpenAM needs an SSOToken, the resource to access, the action the user wants to perform on the resource such as HTTP GET or POST, and a Map of environment settings you can use to specify conditions and attributes in the session or can pass back as an empty Map if your policy does not include conditions and response attributes. The PolicyEvaluationSample class takes as its configuration the user credentials, service name, resource, and action that you provide in a Java properties file. It then authenticates the user to get an SSOToken using the TokenUtils.java helper methods. At that point it has sufficient information to request a policy decision. The implementation of the sample client follows. + "userName=" + userName + ","
+ "resourceName=" + resourceName + ","
+ "serviceName=" + serviceName + ","
Before you run the script that calls the sample, edit the properties file, resources/policyEvaluationSample.properties, to indicate the user credentials, resource to access, and HTTP method to use. You can use a resource that might not exist for the purposes of this example. Also, set up a policy in OpenAM that corresponds to the resource in question. You can set up the policy in OpenAM console under Access Control > Realm Name > Policies. Concerning the Realm Name, notice that unless you change the code, the sample uses the top-level realm, / to authenticate the user. With the properties configured and policy in place, get the decision from OpenAM using the script, scripts/run-policy-evaluation-sample.sh. As you see, the policy decision response is formatted here as an XML document. Notice here the line showing that OpenAM has allowed access to the resource. The PolicyDecision element is defined in openam/WEB-INF/remoteInterface.dtd where openam is the location where the OpenAM web application is deployed. This chapter introduces OpenAM Fedlets, and shows how to use the Fedlet as part of your Java web application. An OpenAM Fedlet is a small web application that can do federation in your service provider application with OpenAM acting as the identity provider. The Fedlet does not require an entire OpenAM installation alongside your application, but instead can redirect to OpenAM for single sign on, and to retrieve SAML assertions. The OpenAM administrator running the identity provider server creates a Fedlet.zip file for your service provider application, and then sends you the .zip. (Optional) Before creating the Fedlet, create a Hosted Identity Provider if you have not already done so. On the Common Tasks page of the OpenAM console, click Create Fedlet. Note that the Circle of Trust includes your hosted identity provider, and that Identity Provider is set to your to hosted identity provider. Name the Fedlet, and also set the Destination URL. You can use the deployment URL, such as http://www.example.com:8080/fedlet as both the name and the destination URL. If you must map attributes to match profiles on the service provider, set up the attribute mapping. To prepare to perform the Fedlet Attribute Query example, set CommonName=cn, GivenName=sn, and UserStatus=inetUserStatus. Click create to generate the Fedlet.zip file, such as $HOME/openam/myfedlets/httpwwwexamplecom8080fedlet/Fedlet.zip. Provide the Fedlet to the service provider. Fedlet.zip includes the fedlet.war archive corresponding to the identity provider, and a README file. The fedlet.war archive contains both the Fedlet as a demo web application, and also the files you use to include the Fedlet in your service provider application. The README file describes how to use the Fedlet. Deploy the Fedlet in your web container. Browse to the Fedlet URL, and then click the links to set up the configuration directory in $HOME/fedlet, where $HOME corresponds to the user running the web application container. In the Fedlet configuration directory, set up a JKS keystore file, keystore password file, and key password file. For demo purposes, you can copy the test keystore.jks, .keypass, and .storepass from the OpenAM identity provider. Try one or more examples from the Fedlet home page to validate Fedlet setup. After setting up OpenAM with the default subjects, you can login on the identity provider with user name demo and password changeit. The Fedlet includes the following files that you use when building your own service provider application based on the demo web application, including a set of JavaServer Pages (JSP) examples. Configuration files copied to $HOME/fedlet when you first deploy and configure the Fedlet. When deploying your application, you can move these to an alternate location passed to the Java virtual machine for the web application container at startup. For example, if you store the configuration under /export/fedlet/, then you could pass the following property to the JVM. You do not need to include these files in your application. Sample SAML attribute query and response handlers. See the Fedlet README file for more information. Demo application. You can remove these before deployment to replace them with your application. Sample SAML XACML query and response handlers. See the Fedlet README file for more information. Fedlet web application configuration, showing how JSPs map to URLs used in the Fedlet. Add mappings for your application before deployment. In the web.xml mappings, your application must be mapped to /fedletapplication, as this is the assertion consumer URL set in the Fedlet metadata. Follow these steps for a very simple demonstration of how to customize the Fedlet. Edit fedletSampleApp.jsp to reduce it to a single redirection to myapp.jsp. An implementation of the <html> element of the file follows below. Add a myapp.jsp page to the Fedlet, such as the following. Browse to the Fedlet URL, such as http://www.example.com:8080/fedlet/, and try one of the login methods. After login you are redirected to myapp.jsp. By default when you create the Java Fedlet, signing and encryption are not configured. You can however set up OpenAM and the fedlet to sign and to verify XML signatures and to encrypt and to decrypt data such as SAML assertions. Enable signing and encryption for the Java Fedlet involves the following high level stages. Before you create the Fedlet, configure the IDP to sign and encrypt data. See Federation > Entity Providers > IDP Name > Signing and Encryption in the OpenAM console. For evaluation, you can use the test certificate delivered with OpenAM. Initially deploy and configure the Fedlet, but do not use the Fedlet until you finish. On the Fedlet side set up a JKS keystore used for signing and encryption. For evaluation, you can use copy the keystore.jks file delivered with OpenAM. You can find the file under the configuration directory for OpenAM, such as $HOME/openam/openam/ for a server instance with base URI openam. The built-in keystore includes the test certificate. You must also set up .storepass and .keypass files using the fedletEncode.jsp page, such as http://www.example.com:8080/fedlet/fedletEncode.jsp, to encode passwords on the Fedlet side. The passwords for the test key store and private key are both changeit. Configure the Fedlet to perform signing and encryption by ensuring the Fedlet has access to the key store, and by updating the SP metadata for the Fedlet. Import the updated SP metadata into the IDP to replace the default Fedlet configuration. Restart the Fedlet or container in which the Fedlet runs for the changes you made on the Fedlet side to take effect. The FederationConfig.properties file specifies the paths to the JKS keystore holding the signing or encryption keys for the Fedlet, the keystore password file, and the private key password file. After setting up your keystore and password files as described above, edit the properties file in the configuration directory, such as $HOME/fedlet/FederationConfig.properties, to point to the keystore and password files. Export the certificate to use for signing and encryption purposes. Edit the standard metadata file for the Fedlet, such as $HOME/fedlet/sp.xml, to include the certificate in KeyDescriptor elements, that are children of the SPSSODescriptor element. Edit the extended metadata file for the Fedlet, such as $HOME/fedlet/sp-extended.xml, to set the certificate alias names to the alias for the Fedlet certificate, and the want*Signed and want*Encrypted values to true. If you reformat the file, take care not to add white space around string values in elements. In OpenAM console delete the original SP entity configuration for the Fedlet, and then import the updated metadata for the new configuration into OpenAM on the IDP side. Restart the Fedlet or the container in which it runs in order for the Fedlet to pick up the changes to the configuration properties and the metadata. This chapter explains how to use the Fedlet in your .NET application. You must configure the OpenAM .NET Fedlet to work with the identity provider. Before creating the Fedlet, therefore, set up a Hosted Identity Provider in OpenAM. Before you start, create the hosted identity provider, and the Circle of Trust to which you plan to add the Fedlet. You can perform these steps using the Create Hosted Identity Provider wizard on the Common Tasks page of the OpenAM console. The .NET Fedlet demo requires a signing key for the Identity Provider. For evaluation, use the test certificate installed with OpenAM. Follow these steps to configure and install the .NET Fedlet demo application. Unzip the Fedlet-unconfigured.zip file, and copy the contents of the Fedlet-unconfigured\asp.net\ folder to a working directory. This folder contains the Fedlet.dll library, that you copy to your application's bin\ folder. This folder contains the templates you edit to prepare your Fedlet configuration, including the identity provider and Fedlet (SP) metadata for federation. The completed configuration files belong in your application's App_Data\ folder. This file describes how to set up and configure .NET Fedlets. This folder contains the demo application. Edit the template files in the SampleApp\App_Data\ folder based on where you deploy the Fedlet demo application, and on how your identity provider is configured. Edit fedlet.cot to set cot-name to the name of the Circle of Trust, and to set sun-fm-trusted-providers to include the entity ID of the identity provider, and the entity ID of the Fedlet service provider. Edit sp.xml and sp-extended.xml to configure the entity IDs, URLs, and Circle of Trust names to correspond to your sample application. Export the identity provider metadata from OpenAM, and copy the resulting idp.xml and idp-extended.xml metadata to the Fedlet SampleApp\App_Data\ folder. Hosted entity configuration was written to idp-extended.xml. Hosted entity descriptor was written to idp.xml. Register the Fedlet with OpenAM as a remote service provider using the sp.xml and sp-extended.xml metadata. Deploy the demo application in Internet Information Server. IIS must be installed with ASP.NET and additional application support necessary for web applications beyond static web sites. The additional support is not necessarily installed by default when you activate IIS as a Windows feature. Try the demo application links to run Fedlet initiated single sign on using HTTP POST binding and HTTP Artifact binding. If you are using the embedded directory as a user store, you can authenticate to OpenAM using the demo user whose password is changeit. This chapter introduces OpenAM C SDK. OpenAM C SDK is delivered for selected platforms in libraries/native/agent-csdk/agent-csdk.zip where you unpacked the full version of OpenAM. To prepare to install OpenAM C SDK, first unzip agent-csdk.zip. Unpack the archive for your platform. As a result, you have several directories that include the SDK and also sample client applications. Review the samples/README.TXT file to complete any specific instructions required for your platform. Build the samples in the appropriate way for your platform. On recent systems, you might need to install compatibility libraries for the build to complete successfully. You might make the following change on Linux, for example. Set up OpenSSOAgentBootstrap.properties and OpenSSOAgentConfiguration.properties as appropriate for your environment. Base your work on the template files in the config/ directory. You can find the Password Encryption Key in the OpenAM console under Configuration > Servers and Sites > Server Name > Security. Try one of the samples you built to test your build. OpenAM services solve a wide range of access and federation management problems out of the box. Yet, OpenAM also exposes APIs and SPIs that enable you extend OpenAM services when built-in functionality does not fit your deployment. This part of the guide covers OpenAM mechanisms for plugging in additional functionality not available out of the box. You can extend user profiles by adding custom attributes. This chapter demonstrates how to add a custom attribute to a user profile when storing user profiles in the embedded LDAP directory. Adding a custom attribute involves both updating the iPlanetAMUserService, and also updating the identity repository schema to hold the new attribute. Furthermore, to allow users to update the attribute in their own profiles, you must also update the OpenAM policy configuration stored in the configuration directory. Follow the steps below to create a custom attribute in OpenAM. Create a backup copy of the configuration file for the iPlanetAmUserService. Edit the file to add your attribute as one of the list of <User> attributes. Here, the name refers to the attribute type name used in LDAP. The i18nKey holds either the reference, or in this case the content, of the text that appears in the user interface. Delete iPlanetAMUserService, and then create it from your updated configuration file. Follow the steps below to update the identity repository LDAP schema for the custom attribute, and then update OpenAM to use the custom attribute and object class. If you are using OpenDJ as the identity repository, you can update the schema through OpenDJ Control Panel > Schema > Manage Schema, as described in the OpenDJ documentation. Prepare the attribute type object class definitions in LDIF format. Add the schema definitions to the directory. In OpenAM console, browse to Access Control > Realm Name > Data Stores > Data Store Name. Add the object class, here customObjectclass, to the LDAP User Object Class list. Add the attribute type, here customAttribute, to the LDAP User Attributes list. Follow these steps to make the new attribute editable by users. The steps imply use of the embedded configuration directory. If you use a different directory server to store the configuration, then adapt them for your tools. Login to the control panel for the embedded configuration directory. Connect using bind DN cn=Directory Manager and the the password for amadmin. Select Manage Entries to open the LDAP browser. Search with LDAP Filter: set to ou=SelfWriteAttributes, and then expand the tree views to see the two entries found. In the entry under iPlanetAMPolicyService, edit the sunKeyValue attribute to add your custom attribute to the list of self-writable attributes, as in <Value>customAttribute</Value>. In the entry under sunEntitlementIndexes, edit the sunKeyValue attribute to add your custom attribute to the list of self-writable attributes, as in replacing the last \n in the list with ,\n \"customAttribute\"\n. Restart OpenAM or the web container where it runs. Login to OpenAM console as a user to check that a user can save a value for your new, custom attribute. This chapter shows how to customize authentication with a sample custom authentication module. For deployments with particular requirements not met by existing OpenAM authentication modules, determine whether you can adapt one of the built-in or extension modules for your needs. If not, build the functionality into a custom authentication module. The sample authentication module prompts for a user name and password to authenticate the user, and handles error conditions. The sample shows how you integrate an authentication module into OpenAM such that you can configure the module through OpenAM console, and also localize the user interface. The name for the sample authentication module is SampleAuth. Notice how this name is used to form module component names according to OpenAM conventions. An OpenAM authentication module is comprised of five components. The authentication logic, which is a class that extends the com.sun.identity.authentication.spi.AMLoginModule class. In this case, SampleAuth.java. The principal, which is a class that implements the java.security.Principal interface. In this case, SampleAuthPrincipal.java. The callbacks XML file, which describes the states of authentication logic and the user input needed for each state. In this case there is one file, SampleAuth.xml. The service configuration XML file, which defines how the authentication module is configured in OpenAM. In this case, amAuthSampleAuth.xml. The properties files for the module, which map localized strings to identifiers used elsewhere in the module. In this case, amAuthSampleAuth.properties. OpenAM callbacks XML files prompt the user for identity information needed to process the authentication. The document type for a callback XML file is described in war-file-name/WEB-INF/Auth_Module_Properties.dtd. Callback files for built-in modules are under war-file-name/config/auth/default/; extension modules are stored in the OpenAM source tree. This example shows a simplified sample auth callbacks XML file that does no error handling. The file specifies only one state (order="1"), and prompts the user for two pieces of information: user name and password. All strings for the user interface are hard coded into the file. "=//iPlanet//Authentication Module Properties XML Interface 1.0 DTD//EN"
This example shows a full callbacks file with dynamic text and error handling. Use this as your SimpleAuth.xml file. <Callbacks length="1" order="3" timeout="600" header="#TO BE SUBSTITUTED#"
This file specifies three states. The initial state (order="1") is used dynamically to replace the dummy strings shown between hashes (for example, #USERNAME#) by the substituteUIStrings() method in SampleAuth.java. The next state (order="2") handles prompting the user for authentication information. The last state (order="3") has the attribute error="true". If the authentication module state machine reaches this order then the authentication has failed. The NameCallback is not used and not displayed to user. OpenAM requires that the callbacks array have at least one element. Otherwise OpenAM does not permit header substitution. An OpenAM authentication module must extend the com.sun.identity.authentication.spi.AMLoginModule abstract class, and must implement the methods shown below. // OpenAM calls the init() method once when the module is created. // attribute in the callbacks XML file. OpenAM does not reuse authentication module instances. This means that you can store information specific to the authentication process in the instance. The implementation, SimpleAuth.java, is shown below. * "Portions Copyrighted [year] [name of copyright owner]"
// Get data from callbacks. Refer to callbacks XML file. // First errorstring is stored in "sampleauth-error-1" property. // Second errorstring is stored in "sampleauth-error-2" property. // header in callbacks order 3. String new_hdr = ssa + " "
The implementation, SimpleAuthPrincipal.java, is shown below. * Return the LDAP username for this <code> SampleAuthPrincipal </code>. * Return a string representation of this <code> SampleAuthPrincipal </code>. * Return a hash code for this <code> SampleAuthPrincipal </code>. * @return a hash code for this <code> SampleAuthPrincipal </code>. OpenAM requires that all authentication modules be configured by means of an OpenAM service. At minimum, the service must include an authentication level attribute. Your module can access these configuration attributes in the options parameter passed to the init() method. Some observations about the service configuration file follow in the list below. The document type for a service configuration file is described in war-file-name/WEB-INF/sms.dtd. The service name is taken from the module name: iPlanetAMAuthmodule-nameService. In this case, the service name is iPlanetAMAuthSampleAuthService. The service must have a localized description, retrieved from a properties file. The i18nFileName attribute in the service configuration holds the default (non-localized) base name of the Java properties file. The i18nKey attributes indicate properties keys to string values in the Java properties file. The authentication level attribute name is taken from the module name: iplanet-am-auth-module-name-auth-level, where the module-name is all lower case. Here, the authentication level attribute is named iplanet-am-auth-sampleauth-auth-level. The Sample Auth service configuration includes an example sampleauth-service-specific-attribute, which can be configured through OpenAM console. The service configuration file, amAuthSampleAuth.xml, is shown below. permission and limitations under the License. "Portions Copyrighted [year] [name of copyright owner]"
PUBLIC "=//iPlanet//Service Management Services (SMS) 1.0 DTD//EN"
OpenAM uses a Java properties file per locale to retrieve the appropriate, localized strings for the authentication module. The default properties file, amAuthSampleAuth.properties, is shown below. Once you have the files for the sample authentication module, build the module, and then install the module into OpenAM. The sample authentication module code relies on three .jar files, two of which are deployed with OpenAM, and the third which is provided by your web application container. When you deploy OpenAM, the file is war-file-name/WEB-INF/lib/amserver.jar. When you deploy OpenAM, the file is war-file-name/WEB-INF/lib/opensso-sharedlib.jar. This .jar provides the Java EE Servlet API. If you use Apache Tomcat as your web application container, the file is /path/to/tomcat/lib/servlet-api.jar. Put these libraries for example in a lib/ directory, and then put them on your CLASSPATH to compile the custom authentication authentication module classes. Add the resulting classes to a new sampleauth.jar file. $ jar cf ../sampleauth.jar . Installing the sample authentication module consists of putting the .jar and other files in the right places, registering the module with OpenAM, and then restarting the web application or the web application container. Copy the sampleauth.jar file to war-file-name/WEB-INF/lib/ where OpenAM is deployed. Copy the amAuthSampleAuth.properties file to war-file-name/WEB-INF/classes/ where OpenAM is deployed. Copy the amAuthSampleAuth.xml service definition file to war-file-name/WEB-INF/classes/ where OpenAM is deployed. Copy the SimpleAuth.xml callbacks file to war-file-name/config/auth/default/ where OpenAM is deployed. Register the module with OpenAM using the ssoadm command. See the ssoadm reference in the Reference a full list of Authentication Service Management subcommands. Restart OpenAM, or the web applications container where it runs. Login to the console as OpenAM administrator, amadmin, and browse to Access Control > Realm Name > Authentication > Module Instances. Click New, and then create an instance of your Sample Authentication Module. After creating the module, click the name in the Module Instances list, and configure as appropriate. Now that your module is configured, logout of OpenAM console, to return to the login page. You can try different combinations as seen in SimpleAuth.java. Unless you create a test subject with a user profile in OpenAM or set User Profile creation to Dynamic for the login realm, successful login results in an "User has no profile in this organization" error. This is because OpenAM attempts to redirect the authenticated test user to a profile page that does not exist. Post authentication plugins (PAP) let you include custom processing at the end of the authentication process, immediately before the subject is authenticated. Common uses of post authentication plugins include setting cookies and session variables. Post authentication plugins are often used in conjunction with policy agents. The post authentication plugin sets custom session properties, and then the policy agent injects the custom properties into the request header to the protected application. This chapter explains how to create a post authentication plugin. Your post authentication plugin class implements the AMPostAuthProcessInterface interface, and in particular the following three methods. OpenAM calls the onLoginSuccess() and onLoginFailure() methods immediately before informing the user of login success or failure, respectively. OpenAM calls the onLogout() method only when the user actively logs out, not when a user's session times out. These methods can perform whatever processing you require. Yet, know that OpenAM calls your methods synchronously as part of the authentication process. Therefore, if your methods take a long time to complete, you will keep users waiting. Minimize the processing done in your post authentication methods. The following example post authentication plugin sets a session property during successful login, writing to its debug log if the operation fails. A post authentication plugin code relies on three .jar files, two of which are deployed with OpenAM, and the third which is provided by your web application container. Put the sample plugin in src/com/forgerock/openam/examples/SamplePAP.java, and compile the class. Copy the classes to the WEB-INF/classes directory where you deployed OpenAM. Restart OpenAM or your web container to ensure the post authentication plugin class is loaded. You can configure the post authentication plugin for a realm, for a service (authentication chain), or for a role. Where you configure the plugin depends on the scope to which the plugin should apply. Configuring the plugin at the realm level as shown here, for example, ensures that OpenAM calls your plugin for all authentications to the realm. In the OpenAM console, browse to Access Control > Realm Name > Authentication > All Core Settings... In the Authentication Post Processing Classes list, add the sample plugin class, com.forgerock.openam.examples.SamplePAP, and then click Save. Alternatively, you can configure sample plugin for the realm by using the ssoadm command. iPlanetAMAuthService under /realm was modified. 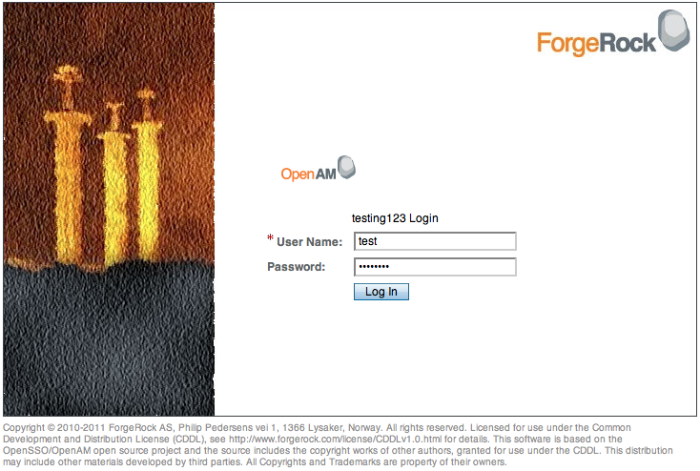 To test the sample post authentication plugin, login successfully to OpenAM in the scope where the plugin is configured. For example, if you configured your plugin for the realm, /realm, specify the realm in the login URL. Although as a user you do not notice anywhere in the user interface that OpenAM calls your plugin, a policy agent or custom client code could retrieve the session property your plugin added to the user session. OpenAM policies let you restrict access to resources based both on identity and group membership, and also on a range of conditions including session age, authentication chain or module used, authentication level, realm, session properties, IP address and DNS name, user profile content, resource environment, date, day, time of day, and time zone. Yet, some deployments require further distinctions for policy evaluation. This chapter explains how to customize policy evaluation for deployments with particular requirements not met by built-in OpenAM functionality. OpenAM comes with sample plugins that demonstrate how to customize policy evaluation. This chapter shows how to compile the samples, and how to configure OpenAM to use one of the plugins. The OpenAM policy framework lets you build plugins to extend subjects, conditions, and response providers for policies, and also extend referrals for policy delegation. When you deploy OpenAM, you find Java code for sample policy evaluation plugins under war-file-name/source/com/sun/identity/samples/policy. Extends the Condition interface. Shows an implementation of a condition to base the policy decision on the length of the user name. Extends the Referral interface. Shows an implementation of a policy referral for delegation. Extends the ResponseProvider interface. Shows an implementation of a response provider to send an attribute from the user profile with the response. Extends the Subject interface. Shows an implementation that defines the users to whom the policy applies, in this case all authenticated users. Before including the plugins in OpenAM, you compile the four files, and package the classes into a .jar for deployment. The sample policy evaluation code relies on two .jar files deployed with OpenAM. $ jar cf ../policy-plugins.jar . The .jar belongs under war-file-name/WEB-INF/lib/. Alternatively, you can add individual classes under war-file-name/WEB-INF/classes/. This section shows how to configure the sample custom policy condition that you built. Configuration involves defining the strings that describe the policy condition, and plugging the policy condition into the iPlanetAMPolicyService, and then restarting OpenAM in order to be able to add the condition to your policies. Add the schema that describes your plugin to OpenAM. Plug-in schema, Condition was added to service, iPlanetAMPolicyService. Set the choice values of the schema to include your plugin with other policy conditions in the policy service. Set the plugin policy condition as one of the default attibutes of the policy service. Schema attribute defaults were added. After completing configuration, restart OpenAM or the web application container. In OpenAM console, browse to Access Control > Realm Name > Policies > Policy Name > Conditions > New... Notice in the list of conditions that you can now apply your Sample Condition. OpenAM maps user and group identities into a realm using data stores. An OpenAM data store relies on a Java identity repository (IdRepo) plugin to implement interaction with the identity repository where the users and groups are stored. This chapter describes how to create a custom identity repository plugin. OpenAM includes built-in support for LDAP and JDBC identity repositories. For most deployments, you therefore do not need to create your own custom identity repository plugin. Only create custom identity repository plugins for deployments with particular requirements not met by built-in OpenAM functionality. Before creating your own identity repository plugin, start by reading the OpenAM source code for the FilesRepo or DatabaseRepo plugins under com.sun.identity.idm.plugins. Your identity repository plugin class must extend the com.sun.identity.idm.IdRepo abstract class, and must include a constructor method that takes no arguments. When OpenAM instantiates your IdRepo plugin, it calls the initialize() method. The configParams are service configuration parameters for the realm where the IdRepo plugin is configured. The configParams normally serve to set up communication with the underlying identity data store. OpenAM calls the initialize() method once, and considers the identity repository ready for use. If you encounter errors or exceptions during initialization, catch and store them in your plugin for use later when OpenAM calls other plugin methods. After initialization, OpenAM calls the addListener() and removeListener() methods to register listeners that inform OpenAM client code of changes to identities managed by your IdRepo. You must handle listener registration in your IdRepo plugin, and also return events to OpenAM through the IdRepoListener. When stopping, OpenAM calls your IdRepo plugin shutdown() method. You are not required to implement shutdown() unless your IdRepo plugin has shut down work of its own to do, such as close connections to the underlying identity data store. Your IdRepo plugin provides OpenAM with a generic means to manage subjects—including users and groups but also special types such as roles, realms, and agents— and to create, read, update, delete, and search subjects. In order for OpenAM to determine your plugin's capabilities, it calls the methods described in this section. The getSupportedTypes() method returns a set of IdType objects, such as IdType.USER and IdType.GROUP. You can either hard-code the supported types into your plugin, or make them configurable through the IdRepo service. The getSupportedOperations() method returns a set of IdOperation objects, such as IdOperation.CREATE and IdOperation.EDIT. You can also either hard-code these, or make them configurable. The supportsAuthentication() method returns true if your plugin supports the authenticate() method. Your IdRepo plugin implements operational methods depending on what you support. These methods perform the operations in your data store. OpenAM calls create() to provision a new identity in the repository, where name is the new identity's name, and attrMap holds the attributes names and values. OpenAM calls the following methods to retrieve subjects in the identity repository, and to check account activity. If your data store does not support binary attributes, return an empty Map for getBinaryAttributes(). OpenAM calls the following methods to update a subject in the identity repository. OpenAM calls authenticate() with the credentials from the DataStore authentication module. The delete() method removes the subject from the identity repository. The name specifies the subject. The IdOperation.SERVICE operation is rarely used in recent OpenAM deployments. Your IdRepo plugin must link to amserver.jar, which when you deploy OpenAM is war-file-name/WEB-INF/lib/amserver.jar. You can either package your plugin as a .jar, and then add it to war-file-name/WEB-INF/lib/, or add the classes under war-file-name/WEB-INF/classes/. To register your plugin with OpenAM, you add a SubSchema to the sunIdentityRepositoryService using the ssoadm command. First, you create the SubSchema document having the following structure. Also include the AttributeSchema required to configure your IdRepo plugin. Notice the i18nKey attributes on SubSchema elements. The i18nKey attribute values correspond to properties in the amIdRepoService.properties file, stored under war-file-name/WEB-INF/classes/. OpenAM console displays the label for the configuration user interface that it retrieves from the value of the i18nKey property in the amIdRepoService.properties file. Register your plugin using the ssoadm command after copy the files into place. Login to OpenAM console as administrator, then then Browse to Access Control > Realm Name > Data Stores. In the Data Stores table, click New... to create a Data Store corresponding to your custom IdRepo plugin. In the first screen of the wizard, name the Data Store and select the type corresponding to your plugin. In the second screen of the wizard, add the configuration for your plugin. After creating the Data Store, create a new subject in the realm to check that your plugin works as expected. You can do this under Access Control > Realm Name > Subjects. If your plugin supports authentication, then users should now be able to authenticate using the DataStore module for the realm.